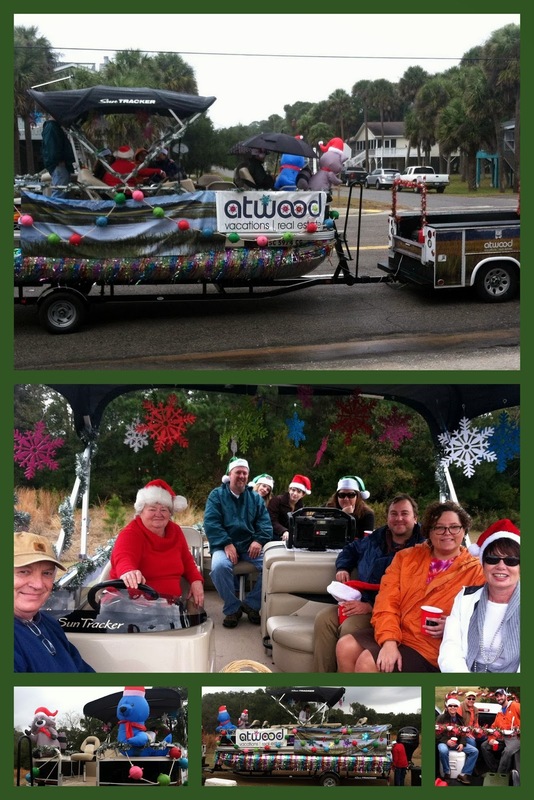 Atwood Vacations had really big shoes to fill during the annual Edisto Beach Christmas Parade on December 14. Stretching from the 700 block of Palmetto Blvd. around past the Pavilion, this event is attended by locals and visitors alike! Atwood took first prize in 2012 with a wonderful, handcrafted float that took many hours and late evenings to build. Singing Jingle Bells for the judges, the entire Atwood Vacations & Real Estate staff mustered enough spirit to be awarded second prize this year! Typically, we have more than enough spirit, but the cold, wind, and torrential winter rain made this an unforgettable Christmas event. Now that we've dried out and warmed up, we are already looking forward to winning again in 2014! Merry Christmas & Happy Holidays from all of us on Edisto.